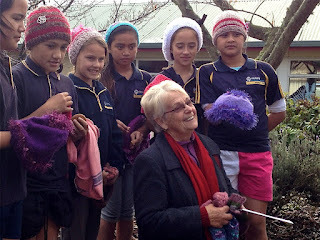 Last Friday, 8 senior students performed for all the teachers because the teachers had a special morning tea for Norma. She knitted the 100 beanies! The song that they choose to sing was Matariki. "I love the beanies. She made them so warm and when I had to take it off I felt really cold on my head," Onejhayah said. "It touched my heart when they sung the sweet flowing song. It felt like I was still a kid,"said Norma. The kids enjoyed themselves and hope they can perform again for the staff.